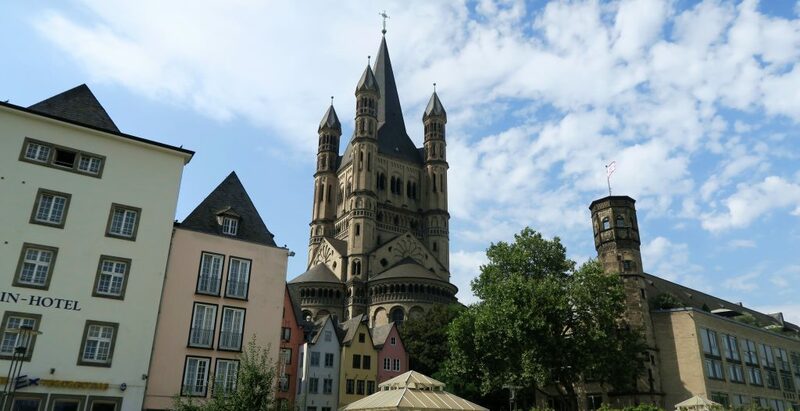 If you’ve read this post about my recent trip to Germany, you’ll know that my long weekend in Cologne was booked because I was in search of one particular magical castle. So, I didn’t really know what to expect from Cologne. I won’t lie, it was never at the top of my list of cities to visit in Germany, let alone in the world, but I’ll do anything for a castle. To say that I’ve travelled to a lot of European cities and seen a lot of churches and cathedrals is an understatement. I can’t remember the last time I visited somewhere that didn’t feature a grand cathedral. So you’d think that I have a bit of cathedral fatigue now (I’ve even got bored of writing the word in this post). But holy crap, this cathedral blows the socks off many that I’ve seen. It’s. So. Big. And so imposing. There’s something eerily beautiful about the exterior and the inside is pretty damn nice too. I am obsessed with curry-wurst. So maybe I’d be happy with anywhere in Germany but Cologne definitely delivered the goods when it came to dining. Everything we ate was great – we even ate twice at the same Italian restaurant (not very German we know, but it was so damn good!). 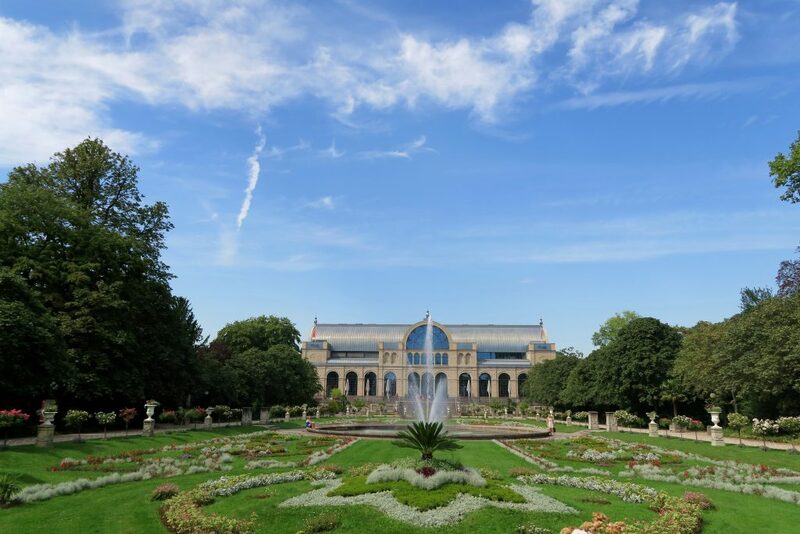 Throw into the mix that Cologne is home to the Lindt Chocolate Museum and you know that you’re in for a treat! And oh my bloody god, that stuff is gooooood. Cologne is famous for it’s German Christmas Markets. Whilst I didn’t visit in Winter, so I can’t confirm nor deny how fab they are, I’ve hear from reliable sources that they one of the best in the country! 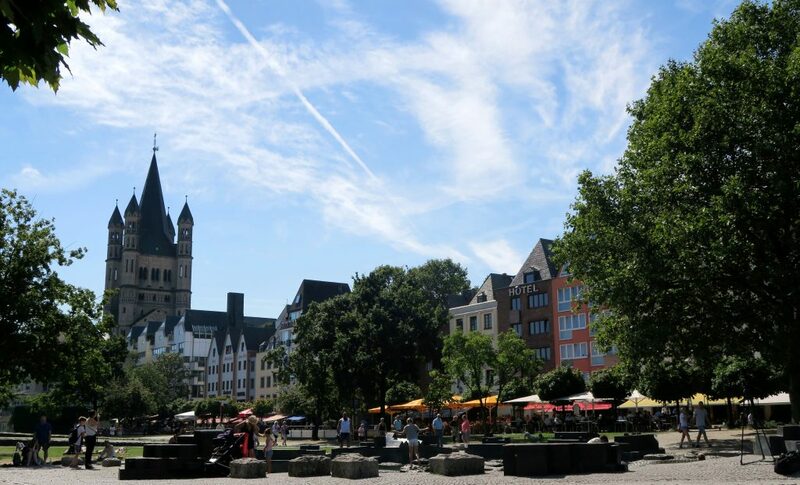 Cologne has a fantastic main train station and is close to some great places – day trips a plenty! If you’re not a fan of moving all of your belongings around regularly, this would be a great base! We took an amazing day trip to Burg Eltz but there were so many other places that we wanted to try – Aachen, Trier, Koblenz, Dusseldorf, Bonn, Essen and Frankfurt to name a few! Germans have a stereotype of being very strict and organised (my kind of people). You can expect that attitude to go completely out of the window in Cologne! Don’t come to Cologne expecting gorgeous rows of fancy old buildings or a charming Old Town city centre like many European cities. I think this is why I didn’t click too much with the city. I love old architecture and charming cities/towns. 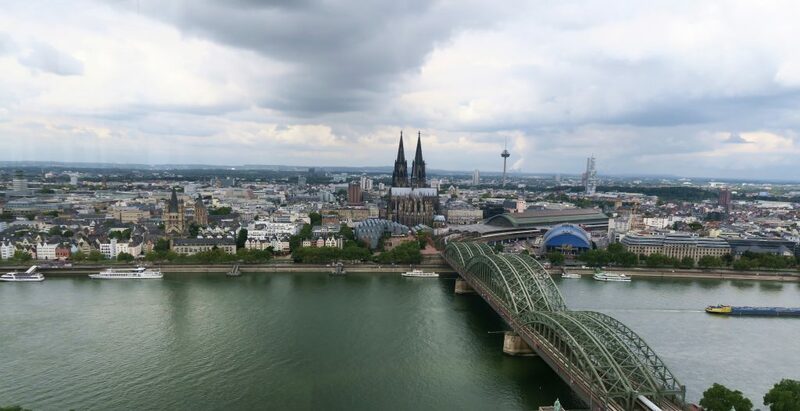 Cologne is a relatively new city. It was was almost completely destroyed in World War II – the United Kingdom’s Royal Air Force alone dropped almost 35,000 tons of bombs on the city. However, the laid back care free attitude of Cologne means that planning permissions/building regulations in the city’s rebuild programme were very lax and you do stumble across some interesting buildings! On one walk along the river, we spotted a tiny house with a giant turret attached! With such higgly-de-piggledy building structures, the city has a much more “rough and ready” vibe than many European cities I’ve been to. And lets’s face it, Cologne doesn’t have the best reputation as of late given the New Years Eve 2016 assults and the more recent knife and gun attack of August 2016. We had absolutely NO reason to feel unsafe whilst in the city, but if you’re of a nervous disposition, maybe stick to the uber-charming “nothing bad could ever happen here” looking cities. Whilst we didn’t struggle to fill our time in the city, this is mainly because I made some bad shoe choices and ended up with horrendous blisters early on. I was in so much pain that sitting down and spending a lot of time eating seemed like a good idea! The freak heat-wave we encountered during our time there also slowed us down, we took a lot of time to stop and get a drink/try to cool down. 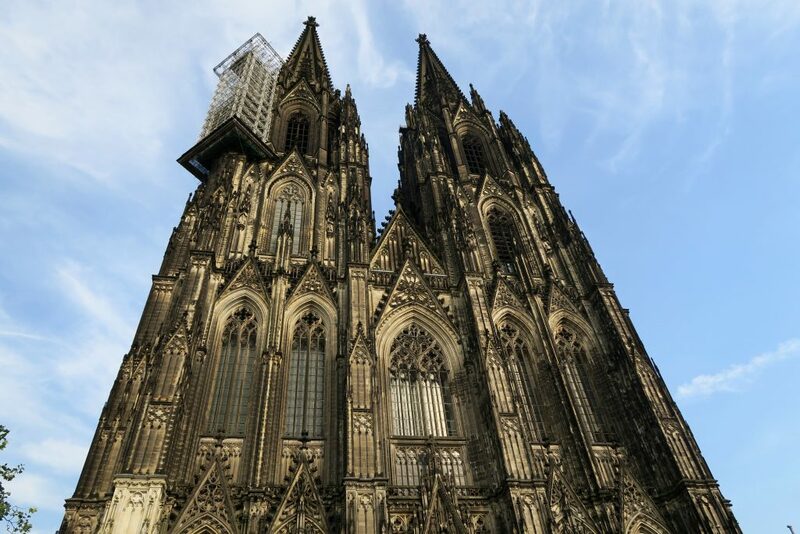 With all of this taken into account, we spent near enough 3 days in Cologne enjoying the tourist attractions. We then took 1 day to visit Burg Eltz. Had I been on top form however, we could have explored the city much quicker and had more time to day those day trips I mentioned earlier! If you’re limited on time in Europe, maybe skip Cologne. Most people come to Europe to escape into our beautiful charming cities, and you won’t find much of that here. It’s ugly (by today’s standards) but it’s also a direct reminder of 20th century history (given that 95% of the city had to be rebuilt in the 50s). Therefore you may still find it worth visiting, because of course learning and understanding the history of the world is important. Unless you are only interested in fairytale-perfect postcard images. It’s no secret that I find central European cities such as Budapest and Prague the most charming, and the South Eastern region of the Balkans the most beautiful area of Europe. 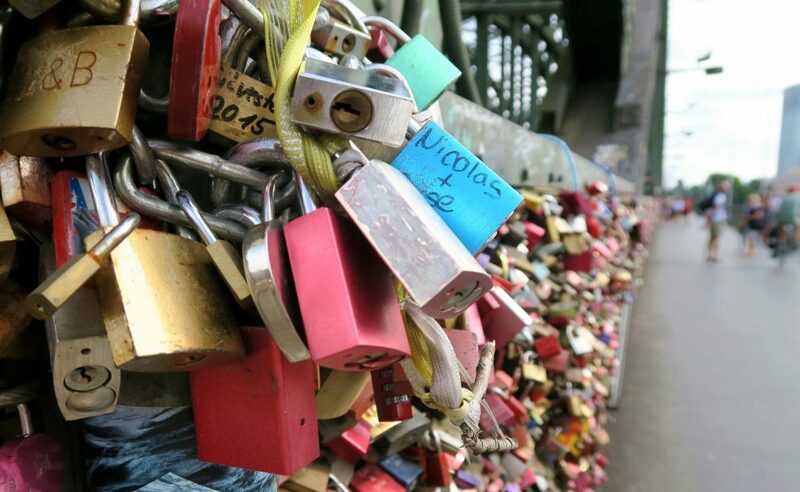 Cologne is a modern city but if that’s what you are after – go wild! On the other hand, if you’re looking for a cheap weekend getaway, this could be the perfect place. If you’re from the UK, Stansted Airport has RyanAir flights flying to Cologne multiple times every day and they are usually dirt cheap. Book in advance and see prices as low as £10 each way. Ours were around £60 return on the August bank holiday weekend – given the popularity of this weekend, this is still pretty incredible! What makes things better is that the flight is little over an hour long – a very easy getaway! Plus… Burg Eltz is TOTALLY worth it. Fancy a few more opinions? 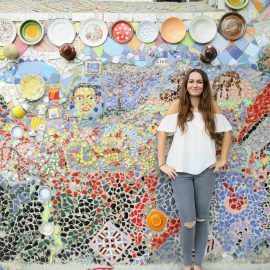 Britt has written a fantastic post about her not-so-fantastic time in the city which you can read here. omg currywurst. what an invention haha! Great review and it was super informative too! Cologne seems like a beautiful place. So good to know – I was thinking of visiting with my family this Christmas! Btw, your photography is AH-MAZING.